From Friday, October 30th to Saturday, October 31st, the Diplomatic Academy of Vienna hosted the Europe-Eurasia Leadership Conference titled “Eurasia and Europe Dialogue: Building Trust and Securing Cooperation for Sustainable Development”. H.E. 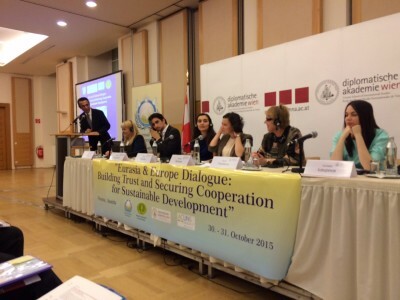 Ambassador Erfani was invited to the conference and delivered a statement at the close of Friday’s session. Ambassador Erfani spoke on Afghanistan’s 15 years achievements and focused on “Engaging Women and youth in Afghanistan’s Transformation”. He noted that women and youth in Afghanistan will continue to play an important role in Afghanistan becoming a prosperous and peaceful country. The National Unity Government of Afghanistan is committed to bringing women full equality and security and increasing their involvement in development, government and society. Ambassador Erfani remarked on the importance of the work to be done during Afghanistan’s Decade of Transformation (2015-2024), which will be successful due to the commitment of the men and women of Afghanistan. The goals to be tackled include implementing the constitution for a new agenda and reshaping the country and its status in the region and the world. Ambassador Erfani also remarked on Afghanistan’s importance as a bridge connecting the region and beyond for promoting trade, transit and most importantly connecting people and civilizations. Ambassador Erfani concluded by saying that women and youth are the best hope for peace, sustainability and development in Afghanistan so that Afghanistan is reedy to play its important role as a bridge in the region. H.E. 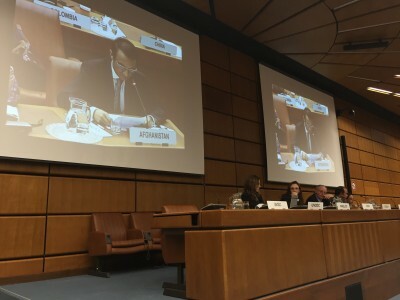 Ambassador Erfani delivered a statement today at the sixth session of the UNODC’s meeting of the Working Group on International Cooperation. 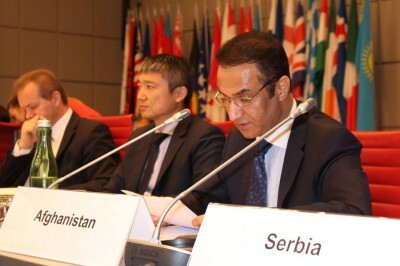 He noted to the participants that, “Despite our collective efforts at a global level to counter transnational organized crime, various forms of crime including the new and emerging ones continue to threaten our societies.” He stated Afghanistan’s support for the work done over the years by the Working Group on International Cooperation. Ambassador Erfani praised the UNODC for developing tools to help Member States take action in fighting transnational organized crime, such as the SHERLOC knowledge management portal. On October 16th, Ambassador Erfani delivered a presentation on “Afghanistan’s Decade of Transformation and Gender Dynamics” at this year’s final meeting of the OSCE Asian Contact Group. After thanking the group’s Chairperson, Ambassador Claude Wild of Switzerland, for the warm welcome and introduction, Ambassador Erfani provided a brief overview about the historical perspective concerning the situation of women in Afghanistan. The Ambassador then highlighted accomplishments achieved since 2001, including a solid framework of both domestic and international legal instruments, institutional building, political commitment, democratic structures and elections, the role of media, and civil society engagement. The Ambassador stated that there is strong commitment by the President of Afghanistan, H.E. Mohammad Ashraf Ghani, by the Chief Executive of Afghanistan, H.E. Dr. Abdullah Abdullah, and as a matter of fact by the entire cabinet, to continue the work in improving the situation for women in Afghanistan. Ambassador Erfani also made reference to the important role of the First Lady of Afghanistan, Rula Ghani, in encouraging participation of women in Afghan politics by forming the Women Advisory Board. 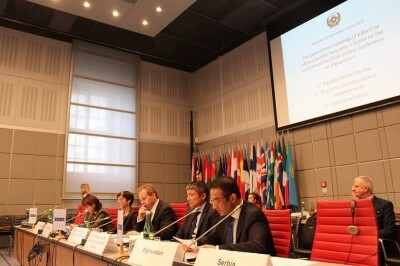 Ambassador Erfani noted the important role of the OSCE in advancing women’s rights in Afghanistan and appealed to the international community to continue and expand the support in implementing the legal and political commitments. He concluded with a request to the OSCE and all present to, “Please continue your assistance and we look forward to further broadening and deepening our collaboration with all of you and with a view to accomplishing a stable, prosperous and democratic Afghanistan for all Afghans. Women constitute more than 50% of Afghan society and without their active participation Afghanistan will not be able reach its goal for a stable, democratic and prosperous future”. Today, the UNODC launched the Executive Summary of the Afghanistan Opium Survey in a simultaneous event in Vienna and Kabul. 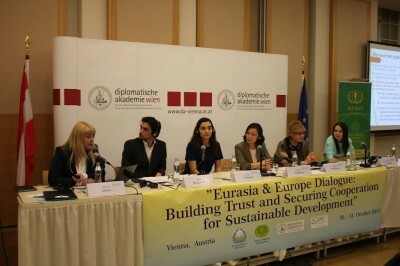 At the event in Vienna, H.E. Ambassador Erfani thanked the UNODC for their valuable support in Afghanistan’s counter narcotics efforts and the support for the production of the Opium Survey. He noted that this year’s survey indicates a considerable decrease in both the cultivation of opium poppy and the production of opium in Afghanistan. Afghanistan has been a prime victim of narcotics and will continue to do its part to make every effort to fight against narcotics. Further steps taken by the National Unity Government of Afghanistan include the recent revision of the counter narcotics strategy and the development of a new National Drug Action Plan (NDAP) for 2015 – 2019. The three main goals of the NDAP are to decrease the cultivation of opium poppy, decrease the production and trafficking of opiates and, to reduce the demand for illicit drugs while increasing the provision of treatment for users. At the outset, I would like to thank the UNODC for its invaluable support to our counter narcotics efforts including the production of the Afghanistan Opium Survey which stands as a prime example of technical support provided by the UNODC to Afghanistan. The survey is also a clear indication of increased capacity in Afghanistan’s counter-narcotics institutions in the area of research and data collection. I would also like to thank Germany, Norway, the United Kingdom of Great Britain and Northern Ireland, and the United States of America for their financial contributions to the production of this survey as well as the rest of our regional and international partners for their continued support to our fight against narcotics in Afghanistan. As the findings of this year’s survey indicate, there has been considerable decrease in both the cultivation of opium poppy and production of opium in Afghanistan by 19% and 48% respectively. The findings also show an increase in the level of eradication by 40% with less security incidences and casualties. 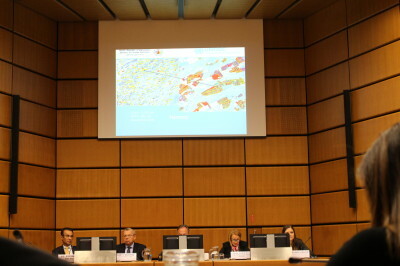 The survey suggests that caution is needed when interpreting these results due to a possible impact of the improved methodology used to estimate the area under poppy cultivation, however, these positive results can be partly attributed to intensified efforts and improved coordination in particular in the area of eradication. As in the previous years and more evidently this year, 97% of total opium cultivation in Afghanistan took place in the country’s most insecure provinces in the South, East and West. This is indicative of a clear link between cultivation of opium and insecurity which remains a major challenge of a regional nature for Afghanistan. The anti-government elements and the criminal and terrorist networks across the region continue to benefit from the production and trafficking of opium as a major source for financing their activities. They are also involved in trafficking of precursors into Afghanistan which are key to processing opiates into heroin and morphine. This year, improved coordination between the Ministry of Counter Narcotics and the Ministries of Defense and Interior has increased security during eradication which was carried out near the areas of military operations in Hilmand and Kandahar provinces. In this context, the Government of Afghanistan is trying to further align the counter narcotics planning with the anti-insurgency military operations. As a prime victim of narcotics, Afghanistan is committed to doing its part to continue every effort in the fight against narcotics. Our recent efforts under the National Unity Government of Afghanistan include the revision of our national counter narcotics strategy, the amendment of the Counter Narcotics Law, and more importantly, the development of our new National Drug Action Plan (2015-2019). – Reducing the demand for illicit drugs and increasing the provision of treatment for users. The Action Plan will be implemented under an integrated and balanced approach which will include both incentives such as alternative development, and deterrents, such as eradication, interdiction, and prosecution. At a national level, successful implementation of the Action Plan requires improved coordination among all national bodies in areas of public health, law enforcement, security, and agriculture and at a regional level it requires regional and international cooperation in areas such as anti-money laundering and asset forfeiture. On the demand side, our focus will be on prevention and evidence-based treatment initiatives. We are planning to mainstream the drug demand reduction into the two public health packages: Essential Public Health System (EPHS) and Basic Public Health System (BPHS). Furthermore, the Drug Demand Reduction will be academically institutionalized in the Higher Education System in Afghanistan. While we appreciate the support provided by the UNODC and our international partners in fighting against narcotics, which remains a truly global and transnational problem, we believe that only cooperative efforts at all levels can be successful to make further strides and we thank the Executive Director for his call for the continued commitment of the international community to devote the necessary resources and support to Afghanistan. With our continued efforts and with continued cooperation from the international community, we can and will secure the positive figures reported in the 2015 Afghanistan Opium Survey. I hope that the United Nations General Assembly Special Session on the World Drug Problem in 2016 will serve as an opportunity to shape our collective efforts in light of the new challenges, trends and realities and that we all will be able to use this opportunity for open and frank discussion about our responsibilities and targets, and on how to meet them based on the principle of shared responsibility. Ambassador Erfani noted the important role of women and that while challenges still remain to bringing them full equality and security, the National Unity Government of Afghanistan is committed to the equality of women and increasing their involvement in elections, government and society. He went on to say that, “With the beginning of Afghanistan’s Decade of Transformation 2015-2024, we have entered a new era, and we the men and women in Afghanistan are committed to implement the constitution for a new agenda, reshape our country and our status in the region and in the world.” In conclusion, Ambassador Erfani said that, “With the beginning of Afghanistan’s Decade of Transformation 2015-2024, we have entered a new era, and we the men and women in Afghanistan are committed to implement the constitution for a new agenda, reshape our country and our status in the region and in the world… Our women are the best hope for peace, stability and development in our country and without their active participation no one will be able to guarantee Afghanistan’s Transformation to a democratic and properties future.” Ambassador Erfani followed his presentation by holding a question and answer session. I would like to thank all our guests – Ambassadors and diplomats, representatives from the United Nations organizations and the OSCE, members of the Austrian Parliament, colleagues from Austrian Federal Ministries and institutions, Municipality of Vienna and the Afghan community in Austria for being with us this evening to celebrate the National Day, the 96th Anniversary of the Restoration of Independence of Afghanistan. The day that the progressive King Amanullah Khan opened a new chapter of the rich history of Afghanistan by introducing a contemporary constitution that enshrined a number of significant reforms and democratic values to form the basis of a modern nation state in Afghanistan. Afghanistan, as an ancient civilization, has had a prominent role in globally promoting culture and science. Preeminent Afghan personalities including Ibn-e-Sina Balkhi, Mawlana, Zakaria Razi, Khajeh Abdullah Ansari, Rabia Balkhi, Nasser Khosro Balkhi, Allameh Sayed Jamal al-din Afghani, to name but a few, contributed to world civilizations. At the same time, the people of Afghanistan for the last four decades had to pay a heavy price to protect the county against foreign intervention, terrorism, and imposed wars, but also produced numerous outstanding leaders and personalities who sacrificed their lives for the freedom and independence of Afghanistan. 15 years ago, Afghanistan, with the support of the international community, opened another new chapter of its history and during these years we have made significant progress in laying the foundations and building institutions to establish an independent and democratic state. The National Unity Government, making every effort at the national level and reaching out to our partners in the region and beyond for their continued support to consolidate our achievements and implement our National Priority Programs for the success of Afghanistan’s Decade of Transformation (2015-2024). To this end, Afghanistan has been actively engaged with the international community and Vienna has proved to be one of the most important capitals for us. Here in Vienna and over the past two years we have made successful efforts to further strengthen the fruitful and friendly relations with the Embassies and Permanent Missions of our partner countries as well as with the OSCE, IAEA, UNIDO, UNODC, CTBTO, IACA, OFID and other international and regional organizations and I am grateful for their cooperation. Our relations and cooperation with Austria, which started back in the 1950s, are valuable to us and dynamic. We thank the Austrian Government and people for their support towards Afghanistan’s reconstruction and stabilization process for the last 15 years, and we are grateful for Austria’s generosity in hosting Afghan refugees in this beautiful country. Let me reiterate that for the past fifteen years, the people of Afghanistan, supported by our partners in the international community, have accomplished tremendous achievements including but not limited to: the creation of equal opportunities for all Afghan citizens, men and women; the establishment of a democratic government; holding of democratic elections on all levels; assumption of responsibility from the international forces; expansion of friendly long-term strategic relations with countries in our region and beyond; provision of education for millions of kids, 40% of whom are girls; progress in the health sector and in the infrastructure with now millions of internet users and the activation of the first Afghan satellite under the name Afghan-1. We are also very proud of our strong, free and independent media landscape, boasting 90 TV stations, 220 radio programmes and 600 print media. Clearly, Afghanistan has made enormous achievements in all social, political and economic areas. However, we are well aware of the many remaining and emerging challenges in the country, which remain priorities to be tackled by the National Unity Government of Afghanistan. The year 2015 has been an important year for Afghanistan. Since last year when we gathered here in the same venue, Afghanistan has completed the process of Transition and has entered the Decade of Transformation, with both historic achievements and remaining and emerging challenges on our scorecard. Following the Transition process, the establishment of the National Unity Government has been a great achievement for the country. Representatives of all political parties and ethnic groups are represented in the Government’s leadership. They all had played their important roles over the past fifteen years and remain strongly committed to defend our achievements made during this period and to lead Afghanistan towards a peaceful, stable and democratic future. Shortly after the National Unity Government was established, agreements have been signed with the United States and NATO. The President paid visits to most countries in the region and many other states, explaining the positions of his cabinet and seeking opportunities for enhanced collaboration. In his inaugural speech, President Mohammad Ashraf Ghani named the thematic main pillars of Afghanistan’s Foreign Policy: 1. our neighboring countries; 2. the Islamic countries; 3. Europe, the U.S., Canada and Japan; 4. the Asian countries; 5. international institutions. Regional cooperation remains a key element within our foreign policy, and we consider the Istanbul Process, launched in November 2011, as the foundation for confidence-building in regional integration. President Ashraf Ghani participated in the 4th Ministerial Conference of the Istanbul Process, held in Beijing in 2014, where he also emphasized on the importance of regional cooperation. We believe that stability in Afghanistan is interconnected with stability in the region. Therefore, Afghanistan signed agreements on good neighborly relations with our regional partners. We are convinced that together we can and will manage to effectively strengthen peace and security in our region. The signing of bilateral agreements with the United States, NATO, regional countries and additional states of the international community shall not constitute any threat to other countries and our much-valued friendship with the United States is not intended to affect our friendship with other countries. On the contrary, it is our goal to help build bridges in order to achieve comprehensive and global security, peace and stability. Our cooperation with all Islamic countries aims at building even stronger relationships. We are grateful for any assistance received from these countries and we hope for strengthened collaboration with the Islamic countries and the OIC in the future, also in terms of our joint fight against terrorism and extremism. It is our hope that all Islamic countries and institutions may unify their positions in this regard. The government remains dedicated to further strengthen our relations with our partner countries but also with all other friendly nations. 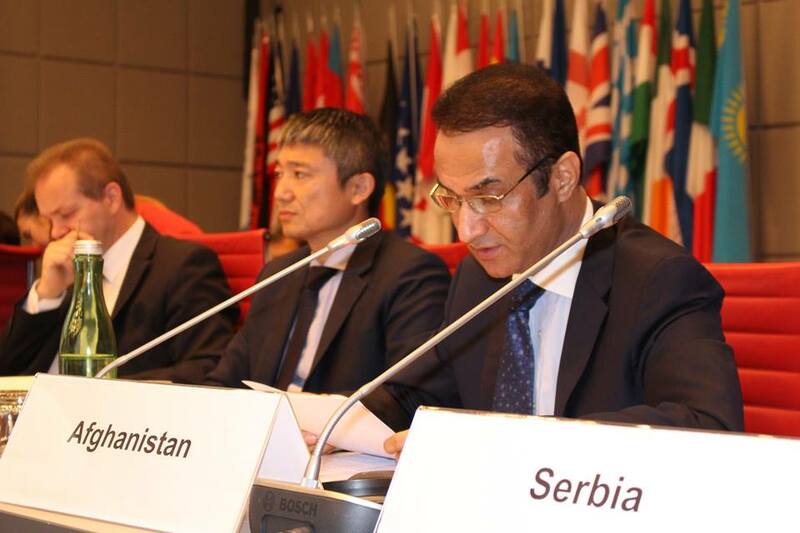 By accepting the leadership role of the Istanbul Process and RECCA-VI meetings in 2015, Afghanistan demonstrated the economy-orientated nature of its foreign policy. At the RECCA-VI meeting held in Kabul this month, on 3 and 4 September, delegates discussed a number of crucial topics including railway projects, energy transfer, mine exploitation, expanding trade and economic relations, and upscaling training and technical cooperation to support Afghanistan’s integration in the regional and global economy. The National Unity Government of Afghanistan also showed its commitment to establish Afghanistan as a hub and crossroads for trade and transit – a connecting point between the Middle East, South and Central Asia. In this context, let me mention some of our major regional projects including the CASA-1000 electricity project, the TAPI pipeline, and a number of planned regional road and railway networks. The envisioned Lapis Lazuli Corridor which is planned to run through Afghanistan and Turkmenistan, across the Caspian Sea to Georgia, and then on to Turkey and Europe, marks another significant undertaking of our economic regional policy. At the London Conference on Afghanistan, held on 4 December 2014, President Mohammad Ashraf Ghani explained the three dimensions of transition in Afghanistan: 1) the political transition, transferring authority rather than power from one elected leader to another; 2) the security transition, with the Afghan National Security Forces assuming responsibility for the country-wide security, with the assistance for our international partners; and 3) the economic transition, where we have to redouble our efforts in order to accomplish our minimum objectives. The President also made reference to a number of inter-related cross-dimensional priorities, such as the empowerment of women and youth, as well as the promotion of accountability, good governance and the fight against corruption. The Afghan National Security Forces (ANSF) demonstrated their capability to provide security for the Afghan people and to defend the country against external and internal threats. To this day, Afghanistan remains a victim of international terrorism. We call on our friends and partners to continuously support our security forces through training and advice, equipment and funding. The Resolute Support Mission (RSM) provides great opportunities for further enhancing the capabilities of the ANSF. The fight against international terrorism including DAESH requires an aligned global response. The National Unity Government considers peace essential for the Afghan people and achieving peace clearly remains a priority. To this end, the Government seeks peace talks with all groups willing to accept the norms, values and principles as have been set forth in our constitution. At the same time, the Government will continuously respond to all security challenges and will oppose all terrorist groups in the country. No parallel political structures shall be accepted. Our fight against the cultivation and trafficking of illicit narcotics also remains high on our agenda, as the global menace of drugs is intertwined with many other transnational scourges including terrorism, and other forms of organized crime. We are counting on our partners in the region and beyond to jointly tackle this problem in all its facets, from demand reduction and eliminating the flow of chemical precursors to border security. The principle of shared responsibility must be upheld. The Afghan Embassy and Permanent Mission in Vienna remains grateful to its host country, as we are sharing excellent relations that have been established six decades ago. Austria, our beautiful host country, has contributed to the international community’s stabilization efforts in Afghanistan and is taking part in the Resolute Support Mission. As I mentioned earlier, Afghanistan also greatly appreciates Austria’s generosity in hosting refugees from our country. In this context, let me say that Afghanistan is committed to the voluntary, dignified and gradual return of all refugees, whilst taking into account absorption capacities in Afghanistan. We recognize that returning refugees can play an essential role in rebuilding the country. However, we consider the issue of refugees as a purely humanitarian matter and believe that political trade-offs should not affect this important human rights issue. The Government of Afghanistan is looking forward to enhanced cooperation between Austria and Afghanistan and we are convinced that the ongoing Decade of Transformation will offer plenty of fresh opportunities for increased economic and political engagement between our two countries. Today, I wish to thank all of you present here, representing the friends and partners of Afghanistan who contributed financially and, sadly, also by sacrificing the beautiful lives of their loved ones, to provide a better future for the Afghan people. The Afghan people will never forget your most generous help and in particular those who lost their lives, and we will hold your precious friendship in high esteem. Please be reassured that the Government will play its role as an active member of the international community, as a young, committed democracy, contributing to the protection of our shared values of humanity, freedom, peace, human rights and international security. I wish to take this opportunity to welcome the new Ambassadors here in Vienna and wish good luck to those who will leave soon. Let me once again thank you all for joining us tonight, and without further ado, I now open the dinner buffet and I wish you all a wonderful evening. Hopefully, you will enjoy the Afghan food. Thanks for coming! On occasion of Eid al-Adha, Diplomats and H.E. Ambassador Ayoob Erfani, attended the Eid Prayer at the Mosque as well as a gathering of Afghans residing in Vienna. 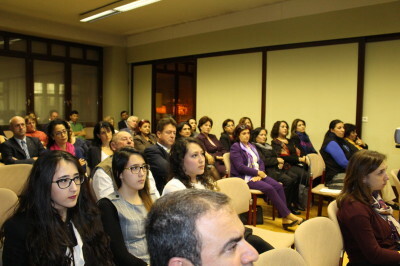 At the gathering, Ambassador Erfani congratulated those present and wished them and their families success. He also expressed his wishes for sustainable peace and stability for Afghanistan. The Embassy and Afghan community in Vienna also celebrated in a special reception at the Embassy, on the second day of Eid al-Adha, which coincides this year with the day chosen to celebrate the National Day of Afghanistan here in Vienna. On September 16th, H.E. Ambassador Erfani delivered a statement to the 59th General Conference of the International Atomic Energy Agency. 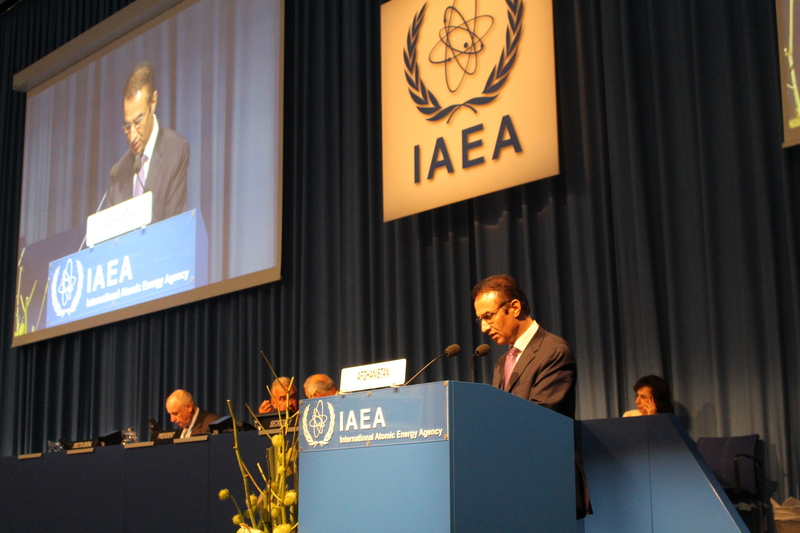 He began by welcoming the newest members of the IAEA family, Antigua and Barbuda, Barbados, and Turkmenistan. Ambassador Erfani noted the importance of the General Conference for sharing information and evaluating opportunities to address issues of international peace and nuclear safety and security. He noted the importance of nuclear science and technology to the development of Afghanistan and for achieving the goals of the National Unity Government under the Country Program Framework (2012-2016). 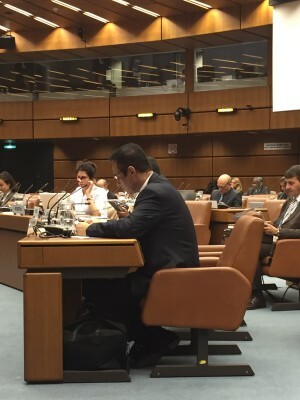 Ambassador Erfani was pleased to report that the Parliament of Afghanistan has ratified Afghanistan’s Nuclear Act, drafted by the Afghanistan Atomic Energy High Commission (AAEHC) with the IAEA’s assistance on 10 September 2015.